I should mention at this point that we decided not to hire movers for our translocation (is that a word, sounds painful) to the States. We decided to move ourselves, easy when you’re a bloke who doesn’t really care if half his cr@p ever arrives or not, different when you’re a girl with a shoe collection that you are emotionally attached to (hey, even on a fat day shoes still hug you back). So there I was, in Hawaii, part of the way to our new home in San Francisco, I had suitcases snapping at my heels, bags slung over each shoulder like a deranged postman, a rucksack on my back counterbalanced by its twin on my front. I was wobbling around in the Hawaii heat, giving evil glares to this tanned skinny dude who was grinning at me from the barrier. Hang on, I know that grin...wobble-wobble-wobble-crash- wobble-drag-curse-wobble-wave-wobble-grin-wobble-run-wobble-crash-bang- BOOM! Cue epic romantic movie embrace. 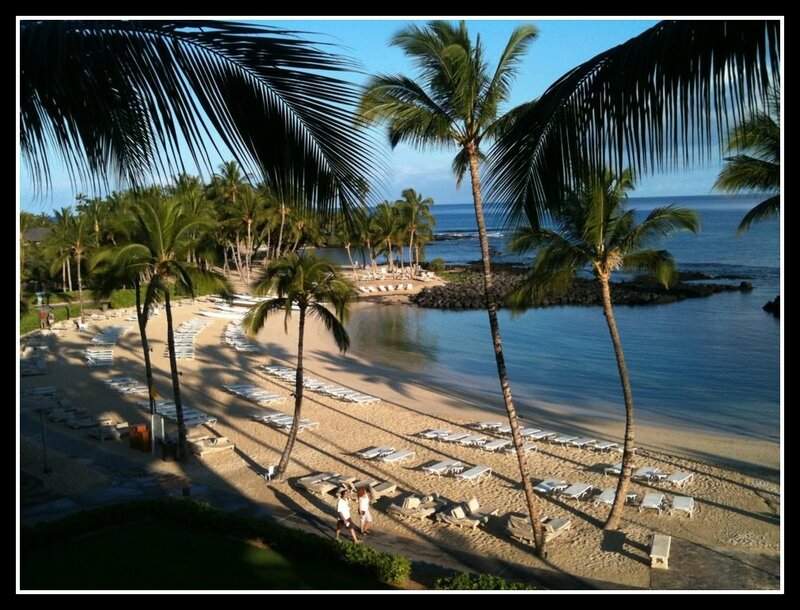 Hawaii’s Big Island is like landing on the moon, I know this, not because I am involved in Ireland’s top secret space program “Space – the final hurdle, my money’s on Shergar”, but because I have watched many Hollywood movies about it. The ‘moon’ feeling is due to the lava fields, flows of lava from eruptions that have dried over time into black crust littering the landscape. Among the black rock tourists and locals use white coral to spell out messages, e.g. ‘Joanie loves Chachi’, ‘Joanie married Chachi’, ‘Chachi is a loser’, ‘Joanie hates Chachi’, ‘Chachi R.I.P’. It’s actually very cool to spy on all the commemorations and dedications and you do have to resist pulling the car over on the highway and adding your own two cents. Oh, speaking of the car, in true ‘when in Hawaii’ fashion, Dom had procured a red mustang convertible, Magnum PI eat your heart out. 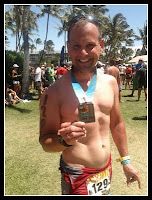 I should point out the reason for Dom’s enviable tan and recent skinniness was due to his training and completion of the Hawaii Half Ironman compeition. Apparently the cool kids call them 70.3’s which reflects the distance they cover – 1.2 mile swim, 56 mile bike ride, and 13.1 mile run. Incredibly impressive and I’m very proud of him for doing it. I will never do one myself, because I am not certifiably insane. Incidentally Lance Armstrong took part and won! It goes without saying that Hawaii has beautiful beaches and lots of lolling about and being a general wastrel was top of the agenda, thankfully our hotel (the Fairmont) accommodated for that in spades (beaches – spades – get it!). It was at the higher end of the scale (when in Hawaii and all that). The island is largely resorts (or certainly gives that feel) but friends have told me there are more reasonable, almost B&B, type options if you stay further from the beaches and closer to the town areas. I didn’t realise that coffee grows on trees and comes from a berry (a berry!! Who knew). Hawaii makes for good coffee growing conditions because of its rich volcanic soil, plus in parts of Kona the clouds roll in everyday, hit the slopes and dump a bucket of rain on the berrys. When the coffee orchid is in full bloom in the springtime the trees produce a white flower which the locals nickname ‘Kona snow’, awww, how cute is that. Then something happens between the berry tree and the cup of coffee in your hand, I can’t remember, harvesting, pulping, rolling, drying, probably not in that order. I do remember that Kona coffee supplies its beans to Starbucks, so in theory you may have drank a coffee that came from a tree that I saw with my own eyes (as opposed to seeing it with someone elses eyes?! )...Oh man, we dream the same dream. 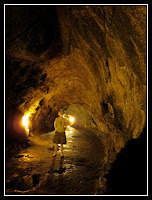 Lava tubes – have to be seen to be believed. They are essentially caves, lava caves. I’m not a geologist (shocker) but I imagine it’s something like this...volcano erupts, lava flows creating a channel through rock, the outer lava cools and hardens, the inner lava is belched out of the channel into a neighbours garden. Job done. (I am available for any National Geographic gigs, speak to my agent). 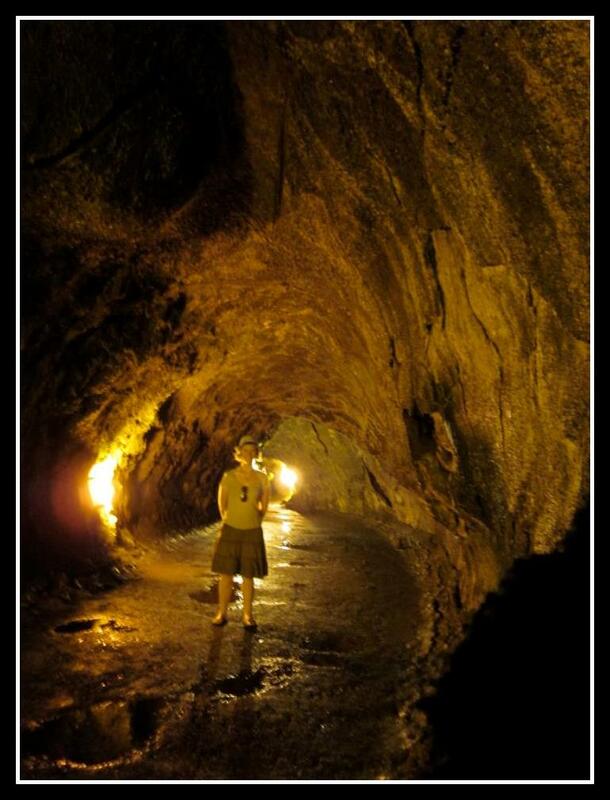 In all honesty though, nature always provides the most spectacular sights and a lava tube won’t fail to impress. Put it this way, Bruce Waynes Bat Cave has nothing on a ‘L’ tube. So excited to read my first post! Love love love! Makes me excited for our trip to Kauai in December! That song makes me well up every time I hear it! Really want to go to Hawaii now. Adore that song and this post is bringing back some great memories, sure 23 hours isn't that long a journey, right?! !